It was pouring rain in Oslo and many other Norwegian cities on Election Day Monday. That was at least some consolation, perhaps, for the thousands of permanent Norwegian residents over the age of 18 who couldn’t brave the bad weather and troop to the polls anyway, because they’re not eligible to vote. Newspaper Aftenposten reported recently that there’s now nearly a half-million people in Norway, many of them long-time residents, who are not allowed to vote in the national parliamentary elections that roll around every four years. That’s largely because of Norway’s law against dual citizenship. Even though tens of thousands qualify for citizenship and could readily obtain a Norwegian passport, the law demands that they’d have to give up the citizenship of their birth, and that’s not easy for anyone who maintains ties with their homeland and views their homeland as an important part of their identity. Like many other foreign residents of Norway, Desjardins has been interested in and actively following the election campaign, telling Aftenposten that it’s helped expand her Norwegian vocabulary as she tries to follow issues involving the so-called velferdsprofitør (welfare profiteer) and formuesskatt (fortune tax). But like all the others lacking Norwegian citizenship, she also lacks a means of representation. State statistics bureau SSB (Statistics Norway) reports that there are 4.12 million people living in Norway who are over the voting age of 18. Of them, fully 448,876 can’t vote in national elections because they lack citizenship. Most work and pay tax in Norway, and the numbers mean 10.9 percent of the adult population has no representation. That’s up from 368,349 at the last parliamentary election in 2013, when they made up 9.4 percent of the population. The numbers are expected to continue to increase, not least because of the EEA/EØS agreement that effectively makes Norway part of the EU’s inner market even though Norway is not a member of the EU. The agreement allows free movement of the workforce among the more than 30 countries in the EU and EEA. 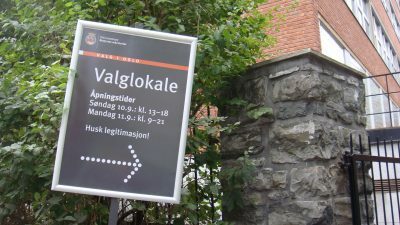 Like permanent residents from other foreign countries, they can vote in local government elections, but not in the country’s most important Stortingsvalg (Parliamentary Election) playing out now, or in any national referendum. Ørnulf Røhnebæk, a lay judge who leads a new government commission charged with reforming Norway’s election law, called it “an extremely interesting question” when asked by Aftenposten whether it was a problem that so many people living and paying tax in Norway have no right to vote for those forming national laws and setting tax rates. It’s not within his commission’s mandate, which instead covers complaint procedures after an election and whether county mergers will or should affect voting jurisdictions, but he thinks it can be an issue worth evaluating. Bernt Aardal, a professor and election researcher at the University of Oslo, thinks it’s a thorny issue because citizenship has always been a prerequisite for voting in Norwegian national elections. While that’s important, he noted that it’s “unfortunate” that large groups of residents lack political representation at the national level. Voter turnout in Norway’s last parliamentary election in 2013 was 78.2 percent, up from 76.4 percent in 2009. Turnout among immigrants who have become Norwegian citizens, meanwhile, was only around 50 percent. If all immigrants with permanent residence (obtainable after three years in the country) were granted voting rights, Aardal fears the overall voter turnout would fall dramatically, because immigrants don’t use their right to vote as much as native Norwegians do. No other European countries allow non-citizens to vote, but many don’t ban dual citizenship like Norway does. A proposal to allow dual citizenship issue was supposed to come up in Parliament last year. It keeps getting put off, but now most all the political parties’ youth organization favour it as do the parties themselves. Siv Jensen, leader of the Progress Party and Finance Minister in the current Conservatives-led government, told newsinenglish.no recently that she expects it will be on the Parliament’s agenda this autumn, regardless of whether the Conservatives or Labour win government power.